This is another place we managed to fit in during our Easter Weekend stay in North Wales. I’ve had to go back to work for a rest. 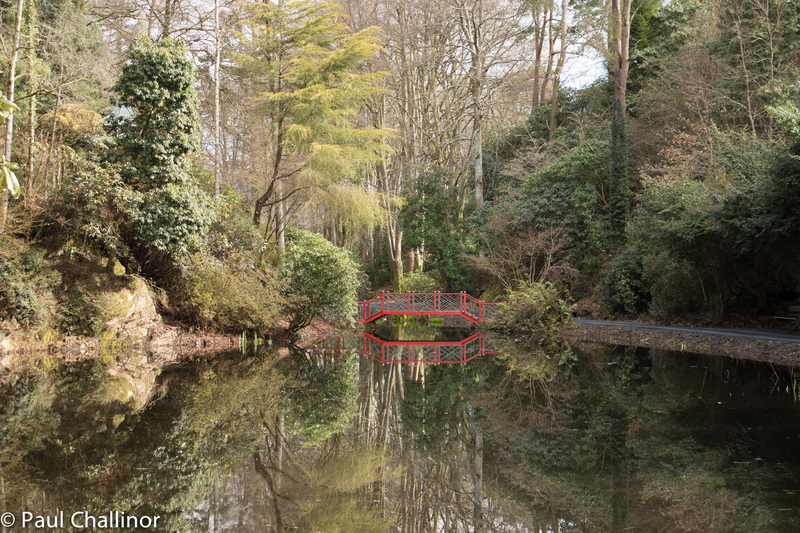 Portmeirion is a strange place. Fitting when you consider the magical myths and legends that abound in Wales. Today it is a mishmash of Italianate buildings that have risen out of the imagination of one man, Clough Williams-Ellis. A man accused of being an eccentric or lauded as a visionary architect. Portmeiron was also the setting for the cult 1967 TV series ‘The Prisoner’, episodes are available on YouTube. The small settlement which existed there previously was known as Aber Iâ (referring to the nearby estuary, or “mouth” of the passing tidal river). In about 1840, a mansion was built there and took the place’s name, sometimes seen on later postcards as “Aberia”. The centre of the village has a small garden square, and the buildings surround this central area. 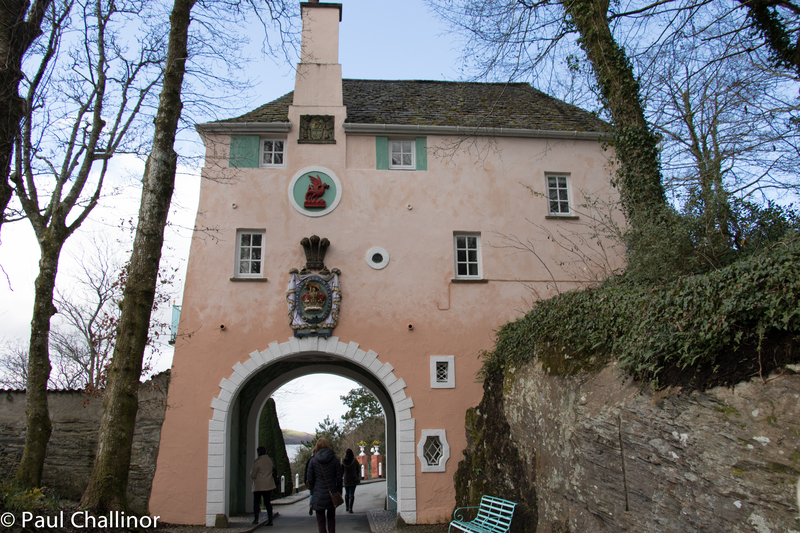 While serving in the army during World War I, Clough Williams-Ellis had refined in his mind an idea he had since childhood. ‘I had to dream of something other than the horror, destruction and savagery’ of the war, he later remembered. His vision was of building an entire village set in a remote and tranquil setting and designed solely according to his own whims. In the years following the war, Wiliams-Ellis searched offshore islands in search of a site on which to create his idyll, but he knew in his heart that the cost of transporting building materials to an island would be prohibitive. When he discovered the little-known Welsh peninsula of Aberia, he immediately recognised that it was a much more practical alternative. 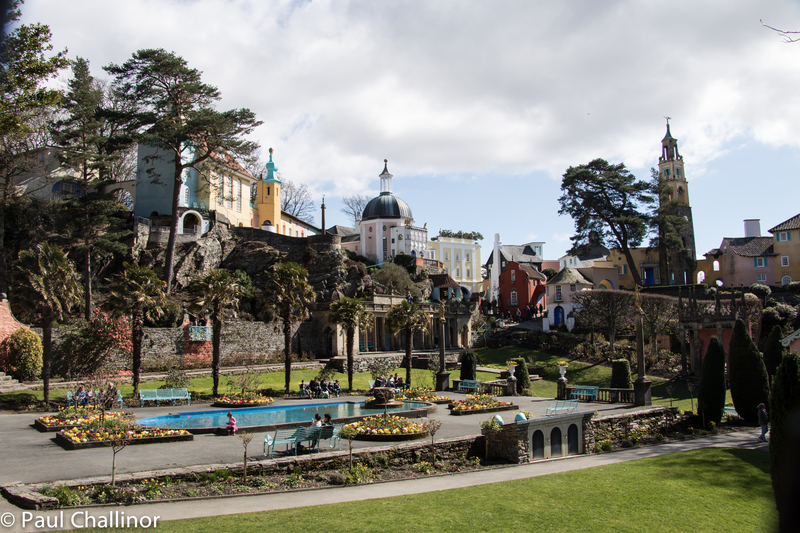 The name of the place, however, did not sound very Welsh, so he changed it to Portmeirion, rolled up his sleeves and, in 1925, got down to his life’s work. The original mansion house is now the main hotel in the village itself. The boat moored on the jetty is in fact concrete. The design and architectural form of the buildings is according to Mumford (1) both romantic and picturesque in Baroque form, “with tongue in cheek.” The total effect is “relaxing and often enchanting” with “playful absurdities” that are “delicate and human in touch”, making the village a “happy relief” from the “rigid irrationalities and the calculated follies” of the modern world. The eccentric nature of the buildings is off set by the beauty of the surrounding Welsh hills and the wide estuary where the Afon Dwyryd joins the Afon Glaslyn. When the tide is out the exposed sands of Traeth Bach provide an ever changing backdrop. Looking south across the estuary from the hotel. 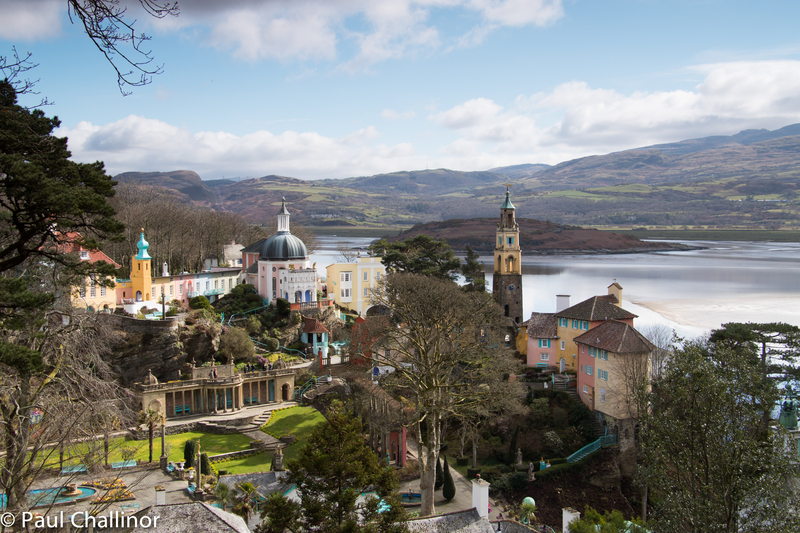 Portmeirion has appeared in many TV shows, pop videos and films. 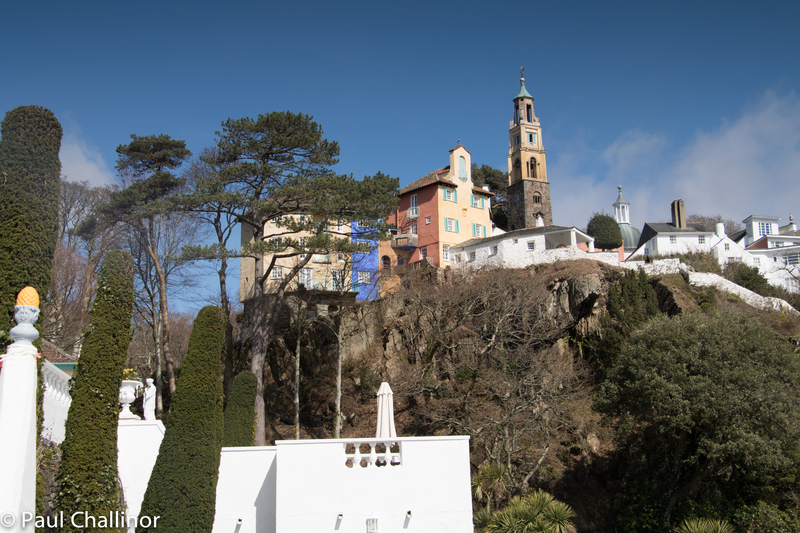 Perhaps the most famous and enduring image of Portmeirion is captured by the 1960s cult TV series “The Prisoner”. 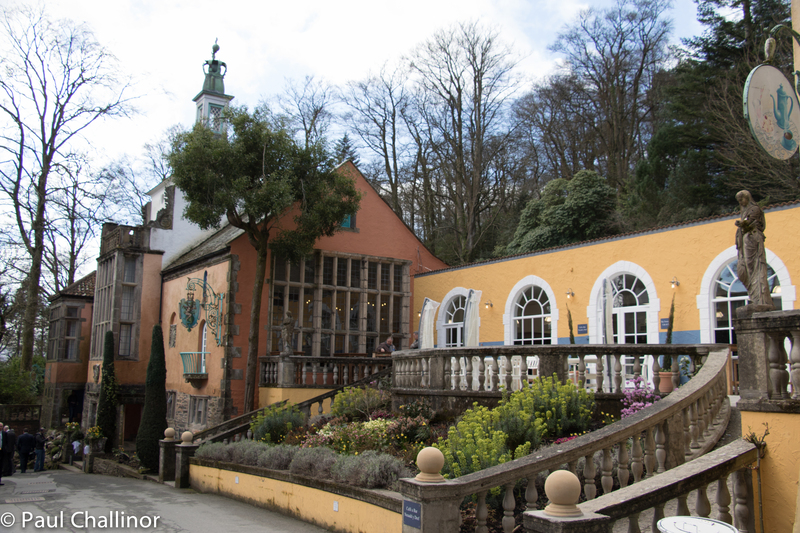 This surreal spy drama in which Portmeirion itself played a starring role as “The Village”, stars Ian McGoohan’s as a senior and high flying intelligence agent, following his resignation from the service. In the Village he is known only as “Number 6”. The story is based on his incarceration and interrogation in an attempt by the authorities to try and understand the reason for his sudden and unexpected resignation. The most surreal part of the story is the giant white bouncing ball that acts as an ever present threatening guard as Number 6 attempts to escape. I watch the first few episodes on YouTube again last night, and had to laugh a little at the White Ball. The town hall was hosting a wedding while we were there. Aunty and I spent a pleasant 30 minutes sitting outside with our coffee and watching everyone arrive. It’s possible to stay in Portmeiron either in the Hotel or in one of the houses that are rented as self catering accommodation. I’ve stayed there with work for a Christmas Meeting a few years ago, and the place is great when all the visitors have left for the day. Aunty has added it on her list of places to stay. I’d better start saving! Looking down onto the village from high while in the bandstand – no music today though. 1: Mumford, Lewis. “From Crochet Castle to Arthur’s Seat” (1962) in The Highway and the City New York: New American Library, 1964. Previous Previous post: Castell Harlech: Welsh 100 – No 20.